The average enthusiast might reasonably expect to find Europe's steepest roller coaster at a mainstream park with a large marketing budget. In a curious twist of history, however, the record has been held for the last four years by Timber Drop (#2067), an El Loco from S&S that beat out the previous contender by just one degree. The ride in question has been installed parallel to the main road at the front of the park, and acts as as an enormous advertisement that catches the eye of passing motorists. Quite a bit of money has been spent on theming and landscaping, with cars that look like logs, an artificial tree stump enclosing part of the first drop, and a small water feature underneath the final turn and brake run. The result looks great, though the on-board experience isn't up to the same standard; a distinctive rattle combined with overhead restraints left me with a mild headache after two laps. 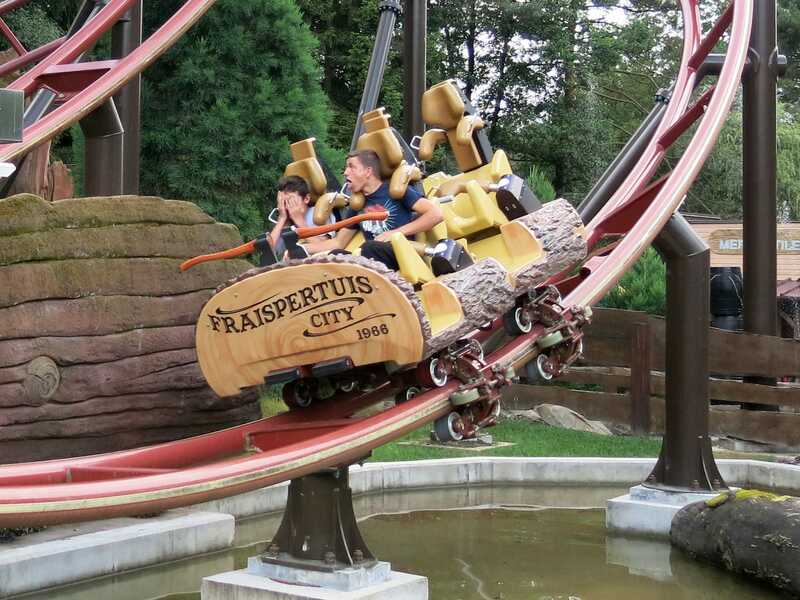 The park added its third roller coaster this year in the guise of Ronde des Rondins, a Zierer family coaster recently retired from Parc Asterix after twenty four years of service. The only visible change from its previous home is a small enclosure over the tyre drive lift hill, which presumably enables operation in wet weather. There were no problems with adults riding; in fact the vast majority of those in the queue today were well beyond the age the designers had in mind. The rest of my visit was spent enjoying several laps on Grand Canyon, an excellent Soquet coaster that I've spoken about before. Today the mid-course brake was being applied with enough force to completely stop the train, but the only track after that point was a small helix, so the overall experience didn't suffer too much. 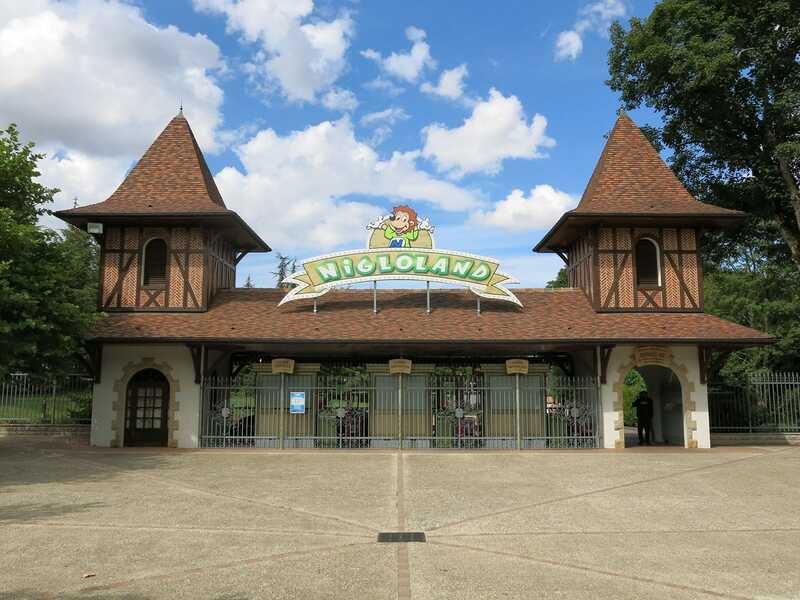 I'd hoped to make it to Didiland today, but a major traffic accident on the way to Fraispertuis City left me with insufficient time to enjoy both parks while still making it back to Paris in time for my flight. Rather than rush around, I decided to head to alter plans and travel to Nigloland instead. Readers following in my footsteps should note that the park is clearly signposted from Exit 23 on the A5. Taking a shortcut via the D101, as recommended by my GPS, is not a good idea. While the routing is picturesque, it is hard to drive efficiently on twenty kilometres of single lane road! Alpina Blitz (#2068) is a Mack-built copy of the Intamin Mega-Lite best known to European readers as Piraten. The layout has some slight differences to the original but they are basically imperceptible to riders, who are treated to a powerful drop, a grey-out helix, and numerous hills punctuated with intense and forceful airtime. The rolling stock is a huge upgrade over the Intamin original, with plenty of leg room and comfortable lap bar restraints lowered from behind. I managed four rides in various locations of the train, and decided that the front seat was my favourite. My next stop was at the Gerstlauer-built Grand Roue, a relatively recent addition to the park that allowed for some nice aerial photographs of the new coaster. With that out of the way, I walked straight onto Schlitt'Express, a mouse coaster which at first glance looked like it might have gained a wooden support structure since my last visit. Closer inspection, however, revealed that I had been fooled by an elaborate paint job. The classic Schwarzkopf Bobsleigh is due to be retired in the near future, a pity if not a huge surprise for a ride originally manufactured in 1973. It was running well today, apart from a continuous squeak as the trains moved from the brake run back to the station. I particularly liked the way the track came very close to a number of tall trees. There was a fairly shocking display of bad parenting on Spatiale Experience. About half way through my ride I noticed the sound of a child screaming in genuine terror, a very different sound to the scream of someone enjoying themselves. When the train stopped in the station the poor girl, who could not have been more than five years old, sat rigidly in her seat with her knuckles white on the lap bar as her parents laughed uproariously. In the end a ride operator had to help remove her, after which she came close to collapsing on the station floor. I'm very much in favour of letting children ride bigger coasters, but if they're overwhelmed by the experience then they need support and encouragement; laughter will only ensure that amusement rides remain a terror rather than the joy that they ought to be. I spent my last hour in the park making a whirlwind tour of a number of different rides, including the Haunted House, the Gold Mine Train, the Chenille (why not! ), and the Africa Cruise boat ride. 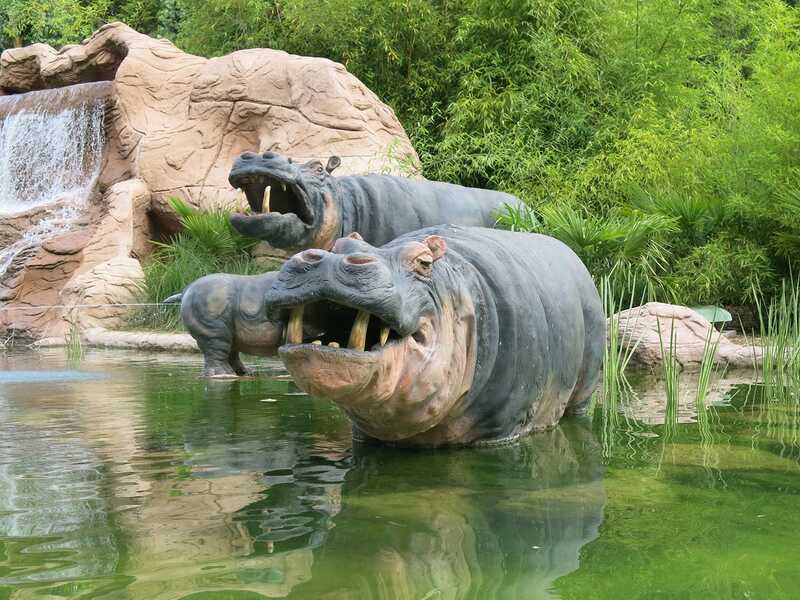 The latter was best described as a low budget version of the well known Disney attraction, with cable driven boats being towed past a number of animatronic creatures and a few lost explorers.